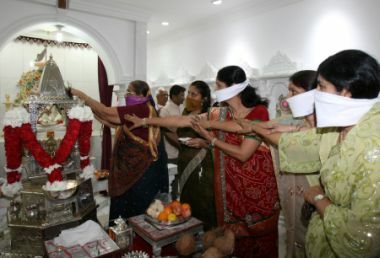 KUALA LUMPUR: The morning breeze was filled with the smell of burning incense as devotees took part in the consecration ceremony of the latest Jain temple in the country. The temple in Bangsar here will cater for an estimated 5,000 Jains. It was built using 4,000kg of marble from India. Human Resources Minister Datuk Seri Dr S. Subramaniam, who was present at the ceremony, said Jains, although a small community, were a significant part of the many cultures and societies that made up Malaysia. Helpful hands: Devotees helping to decorate the altar during a consecration ceremony at the temple in Bangsar yesterday. “Jainism promotes the common development of humanity. It is not just a religion, but a way of life,” he added. Gujarati Association president Datuk Bhupat Rai M. Premji said that holding on to one’s traditional beliefs was important in a rapidly changing world. Jains overcome temptations, anger, greed and pride by practising non-attachment with the material world and living a peaceful and disciplined lifestyle. The three-day ceremony continues with a chariot procession in Lorong Maarof, Bangsar Park, today.